La Ciotat, a seaside city is perfect to put in for a relaxing stay under the sun. It is situated in South of France, in the department "Bouches-du-Rhones" near to Marseille. Of all time, men were attracted and kept by the protective haven of La Ciotat’s bay. In 1622, important shipyards were setting up. The shipyards changed ownership several times during the 20th Century and were the economic lungs of the city. Surrounded by wonderful landscapes, this city has also local heritage concerning culture, religion, traditions. Do you know that the oldest cinema in the world was created there by the Lumières brothers? The city is also known for inventing the game "La Petanque", a typical game in the south of France. The old town centre was built between the end of the 15th century and the end of the 19th century. Today, the heart of the town is home to an extremely rich architectural heritage. As you wander through the town centre, the buildings reveal a whole range of remarkable architectural features such as the house fronts, doors, ornamental moldings and decorations. You will visit Our Lady of the Assumption Church, Sadi Carnot Square or Blue Penitents Chapel. La Ciotat has many green areas that invite you to relax, such as public gardens. For example, Bastide Marin and its gardens encompass a surface of 15.000m2. The illustrious former owners were deep seas navigators. They were Order Knights of Malta and traveled through the Mediterranean Sea while braving storms, creating commercial links and making friendly ties with cities in the West and in the East. Calanques national park which was created on the 18th of April 2012, is France’s 10th national park and the first in Europe to include the land, the sea and urbanization. It stretches from Marseille to La Ciotat and features landscapes of lime rock (between Marseille and Cassis) and red conglomerate in La Ciotat. The park is internationally known for its sublime landscapes, its biodiversity and its rich heritage. Green Island a small wooded island of 12 hectares situated in front of La Ciotat is also a famous place. You can discover on its coast 3 beaches : la Plageolle, Saint Pierre Beach and la Seynerolle Beach. You can access to the island with shuttles boats living from La Ciotat Port. La Ciotat has many places of entertainment in which one can spend enjoyable nights out such as one casino open all year long, two theaters with frequent plays, two cinema venues broadcasting the latest movies, and also bars and clubs with occasional live music. “Rue des Poilus” is the main commercial street in La Ciotat, allowing shopping in a seaside ambiance, you could find a lot of shops to buy everything you need. Otherwise, there are also two commercial malls, the first is called “Ciotat Park” and is composed of 9000m2 of shops at the entry of the city with national brands. The second is “Ancre Marine”. Finally, it should not be forgotten the local market on Tuesday and Sunday. 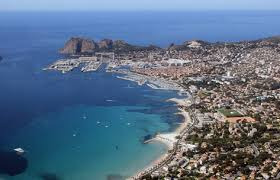 La Ciotat has a typical Mediterranean climate. There is an exceptional sunshine duration of more than 2800 hours of sun per year thanks to Mistrale blows during 93 days per year. The average temperature is 15 °C and during the summer the temperature can rise to 30 °C. You can take the Ciotabus to move across the city. There is a train station to go to the others french cities and the airport of Marseille if you want to come by planes.